Hobomok Skipper and Zabulon Skipper are similar species -- ‘northern’ and ‘southern’ relatives, formerly called Northern Golden Skipper and Southern Golden Skipper. Their ranges overlap through Ohio, Indiana and Illinois, but the Hobomok ranges north well into Canada, and into the southeastern states only in the mountains. The Zabulon on the other hand inhabits the southeastern coastal plain to mid-Florida, but is not (yet) found north of the Great Lakes or in Canada (Opler and Krizek 1984; Layberry 1998). Samuel Scudder and other 19th century lepidopterists confused these two species; Scudder, for example, called the Hobomok Atrytone zabulon, but makes clear that the species he discusses is the same as that which Thaddeus Harris and others called hobomok (1899: 1617). It is probable that Zabulon Skipper did not occur at all in Massachusetts prior to the 20th century, or if it did, its range was limited to the lower Connecticut River valley where it was first found in the 1980's. Therefore, what Scudder and Thaddeus W. Harris had to say about P. hobomok in our area actually does apply to that species, rather than to Zabulon. Thaddeus W. Harris began naming a series of skippers after celebrated Native American Indian chiefs, calling this one Hesperia Hobomok in honor of Hobomok, chief of the Wampanoag Indians, who helped the Pilgrims upon their landing in Plymouth in 1621 ( Harris 1862: 313-4, Fig 137; Opler and Krizek 1984: 314). Scudder named the dark female form “Pocahontas,’ after that famous Indian woman. Harris was the first to scientifically describe the Hobomok. He distinguished his specimen from the Zabulon of Boisduval, and noted that it flew in June and July in his area (Boston). He does not mention a flight in August, when Zabulon would be having a second flight. (1862: 313-4; Fig 137). Harris' "type specimens", syntypes # 26348 (loc. accepted as Mass. ; one dated 6/15/1839), are in the Harvard MCZ today. In addition, in Harris' personal collection at the MCZ there are four Hobomok specimens, male and female, all dated June 10, 1828, taken at "Mount Auburn, Cambridge" Massachusetts (Harris, Index). This is now the site of the Mt. Auburn Cemetery. Harris' are the earliest known Massachusetts specimens of Hobomok Skipper. Scudder's type specimen for the "pocohontas" form, type #15824 at the MCZ, is from Muddy Pond, West Roxbury, Massachusetts, June 11, 1864, presumably collected by Scudder. Along with Peck’s Skipper and Least Skipper, Hobomok is one of only three skippers that Scudder described as “abundant.” Indian Skipper was "very common," and like Hobomok has suffered decline since (Table A). Scudder wrote that Hobomok preferred open country and meadows, but as we know today, its prime habitat is more specifically grassy openings and edges near woodlands. Of the 19th century writers, Maynard did recognize the woodland affinity. Hobomok was almost certainly found in pre-1600 New England, in forest openings, and then appears to have adapted to and benefited (like other meadow skippers) from the massive land clearing for agriculture culminating about 1850 (Table 1). It also seems to have remained common during the re-growth of forests after 1850. However, the Hobomok population is not abundant to the same extent today, and therefore must have declined somewhat since Scudder wrote (Table 2). Hobomok seems to have been particularly abundant around Boston in the 19th century. In one year, 1878, prolific collector F. H. Sprague took 44 specimens of Hobomok Skipper from Wollaston (Quincy) through the months of May and June (Sprague 1879). In the Harvard MCZ today, there are some 36 Hobomok Skipper specimens by Sprague, males, females, and dark form 'pocohontas' females, all from two locations: Malden (24) and Wollaston (16). These were taken in the years 1878, 1879, 1883, 1885, 1886, 1888, 1895 and 1896. On a single day, June 17, 1885, Sprague took 16 specimens in Malden alone. Curiously, although Sprague made many collecting trips out to the Connecticut River valley, he does not mention collecting Hobomok there, and there seem to be no 19th or early 20th century specimens. By the 1930’s it had become clear to lepidopterists that Hobomok Skipper was not the same as the southern-based Zabulon Skipper. In his comprehensive review of New England butterflies Donald W. Farquhar (1934) states flatly that “The true zabulon is a southern species of which I have seen no New England specimens; the published records of zabulon belong to hobomok.” Zabulon Skipper is not definitively reported for Massachusetts until the 1980’s. From the 1930’s through the 1980’s, Hobomok was still thought of as common. Early 20th century specimens in the MCZ and at Yale are from Milton (1915, 1918); Tyngsboro (1918-21), Boston Forest Hills (1920); Melrose (1920), Weston (1921), Wellesley (1930), and Fall River (1931). Farquhar (1934) lists locations for only the dark female “pocahontas” form, mentioning that it had been collected at Stoneham, Milton, Marblehead, and Forest Hills in eastern Massachusetts, and Amherst in the west. At Stoneham, C. V. Blackburn collected male and female Hobomok Skippers on 5/22 and 6/3/1930, and in Worcester H. H. Shephard collected Hobomok on 6/4/1920 (specimens at Furman University). On Martha's Vineyard, Hobomok Skipper (all forms) was "well distributed, but of only occasional capture," according to Frank Morton Jones, but the species had not been found at all on Nantucket according to Charles Kimball (Jones and Kimball 1943). Additional pre-Atlas museum specimens are rife, and reveal a widespread distribution on the mainland, except that there are none from Cape Cod. Locations range from Fall River Bliffin's Beach in Bristol County (1931,1951, W. P. Rogers); to Wellesley (1948, D. T. McCabe), West Acton, Belmont, Concord and Ashburnham (1960's, C. G. Oliver) in the east; Amherst (1961, D. S. Chambers) in the valley; Heath in Franklin County (1981, S. D. Coe); and finally Lee (1965, C. L. Remington) and Sheffield (1982, D. S. Dodge) in Berkshire County (specimens at Yale). Around Boston area in the 1970's William D. Winter found Hobomok in Westwood, Canton and Dover and E. Peters took male and female specimens in Carlisle. D. Willis reports "pocohontas" in the Holliston-Sherborn area in the 1970's (Harvard MCZ; Lep.Soc.Seas.Sum. and Corrsp, 1966-1980). Hobomok and Zabulon Skippers use somewhat different host grasses. Hobomoks are reported to use mainly Panicum and Poa spp. whereas Zabulons use Tridens and Eragrostis (Scott 1986). However, the Connecticut Atlas observed Hobomoks ovipositing on orchard grass (Dactylis glomerata) and little bluestem (Schizachyrium scoparium) in the wild, although they also raised Hobomoks on panic grasses and introduced Kentucky bluegrass (Poa pratensis) in the lab. Hobomoks use small-fruited Panicum [Dichanthelium] microcarpon in West Virginia (Allen, 1997), and deer-tongue Panicum [Dichanthelium] cladestinum in many areas (Cech 2005). Both these grasses are native to and found in Massachusetts. Aside from its use of Panicums and bluegrasses (Poa), Hobomok accepts other grasses in captivity. There is no indication that it makes use of introduced Kentucky bluegrass in the wild. Many authors note that Hobomok Skippers are likely to be seen in or near woodlands, often in grassy, sunny openings, or along forest roads or trails. They also wander to nearby fields, parks and gardens for nectar. Like the Pepper and Salt Skipper and the Arctic Skipper, Hobomok is “closely tied to mixed transitional deciduous woods (Cech 2005).” Interestingly, it is one of the species which often feeds on bird droppings (Gochfeld and Burger 1997: 248, photo 16), a trait common in woodland species. The 1985-90 MAS Atlas found Hobomok in 152 out of 723 blocs, which would actually rank it as Abundant, although it was termed Common. In a striking difference, MBC sighting records 2000-2007 rank Hobomok Skipper as only Uncommon-to-Common relative to other butterfly species (Table 5). It is about on a par with Long Dash and Tawny-edged Skippers in terms of how frequently it has been encountered in the field. 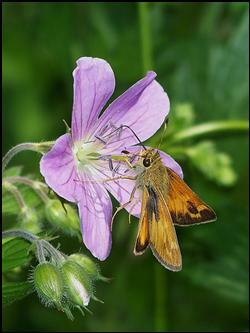 It is not in the Common category, as are Peck’s Skipper, Silver-spotted Skipper, and American Copper. And it is certainly not Abundant. It appears to have dropped in rank since Scudder's time. There is a downward trend in yearly numbers of individuals seen relative to total trip reports (Chart 101). The result for 1992 may be less comparable, because of particularly good numbers reported by just a few observers, but even omitting that year, the trend is still downward. In addition, an important list-length analysis of MBC 1992-2010 records yielded the same downward trend: a statistically significant 33.0 % decline over these years (Breed et al. 2012). For the years 2007-2009, calculations published in the Season Summary in Massachusetts Butterflies show the same picture of mild relative decline. The average number of Hobomok Skippers seen per visit to a location increased 17% in 2007, but decreased 13% in 2008, and 47% in 2009 in comparison to the average for the preceding years back to 1994 (Nielsen, MB 2008, 2009, 2010). The number of reports of Hobomok also decreased in 2008 and 2009 compared to the average for preceding years. Leonard’s Skipper and Long Dash also show similar recent declines. Hobomok's mild decline contrasts especially with the explosive growth in numbers of Zabulon Skippers in the state since 1992. Hobomok Skipper has been reported from 150 of a possible 351 towns in Massachusetts (Map 101), and is well distributed across the whole state, including Martha's Vineyard. The one exception is Nantucket, from which there are still no reports. Hobomok seems particularly common in western and central Massachusetts. It has been found regularly in good numbers on the Northern, Central and Southern Berkshire, Central Franklin, and Northern Worcester NABA Counts -- whereas it has been found only occasionally, in much smaller numbers, on the other Counts, and never on the Blackstone Valley or Barnstable Counts. It could be that it is still flying in July at Count time in the northern upland areas, but has finished flying in the east and south. BOM-MBC reports and numbers for Hobomok are fewer from Cape Cod than from other regions, but Mello and Hansen (2004) list several Cape locations where it is said to be “common.” The Martha’s Vineyard checklist (Pelikan 2002) ranks Hobomok Skipper as “common” on the island, and MBC records bear that out. But MBC has no records from Nantucket, nor did the Atlas, nor, as mentioned, did Jones and Kimball in their exhaustive review of specimens and records. Although the Atlas account refers to the existence of historical reports from Nantucket, this seems to be a mistake. Notably, Mark Mello found Hobomok Skipper on the Boston Harbor islands: on Peddock’s Island and Grape Island on May 31, 2001 (Mello 2002). The Atlas found it on Naushon, in the Elizabeth Islands, on 6/17/1990, D. Gregg. Agawam Robinson SP, 8 on 6/6/2010 C. Kamp and A. Mayo; Amherst, 30 on 6/4/1995 D. Case and M. Fairbrother; Boston probably Arnold Arboretum, 11 on 6/17/1996 B. Malcolm; Burlington Mary Cummings Park, 4 on 5/27/2010 S. and J. Stichter; Charlemont, 15 on 6/16/1996 Diane Potter; Chilmark Great Rock Light, 7 on 6/29/20003 M. Pelikan; East Longmeadow Parker yard, 10 on 6/9/2007 K. Parker; Edgartown, 20 on 6/21/1999 M. Pelikan; Framingham Callahan SP, 5 on 5/24/1998 T. and C. Dodd; Gloucester, 11 on 6/23/1996 D. Savich and C. Tibbits; Grafton Dauphinais Park, 13 on 6/9/2013, D. Price et al. ; Groveland Crane Pond WMA, 8 on 6/3/1998 F. Goodwin; Hardwick, 15 on 6/8/1996 D. Small; Harvard Oxbow NWR, 9 on 6/8/2003 T. Murray; Hingham World's End, 30 on 6/9/1997 B. Cassie; Hopedale Draper Park, 6 on 6/10/2002 B. Bowker; Hubbardston Ware River Watershed DCR, 11 on 6/5/2013, E. Barry and W. Howes; Lexington Dunback Meadow, 10 on 6/10/2011 B. Bowker; Medford Middlesex Fells, 14 on 6/10/1995 B. Malcolm; New Ashford Mt Greylock, 12 on 6/12/2005, M. Lynch and S. Carroll; 12 on 6/12/2005 M. Lynch and S. Carroll; Newbury Martin Burns WMA, 18 on 5/27/2012, S. and J. Stichter; Newburyport Little River Nature Trail, 14 on 5/27/2010 B. Zaremba; North Andover Weir Hill, 7 on 6/4/2001 F. Goodwin; Oak Bluffs Farm Pond, 6 on 6/15/2003 M. Pelikan; Paxton Moore SP, 10 on 6/4/2013 E. and K. Barry; Petersham North Common Meadow, 7 on 6/10/2007 E. Nielsen; Rockport Waring Field, 6 on 6/9/2001 F. Goodwin; Royalston Tully Meadow, 5 on 6/12/2006 C. Kamp; Stow Delaney WMA, 6 on 5/31/2004 B. Walker et al. ; Topsfield Ipswich River WS, 6 on 6/7/2001 F. Goodwin; Uxbridge Riverbend Farm, 6 on 6/5/2004 B., R. and M. Walker; Wales Norcross WS, 5 on 6/13/2006 E. Barry and J. Ohop; Wellfleet Wellfleet Bay WS, 5 on 5/27/2010 M. Faherty; Westborough WMA, 25 on 6/13/2008 W. Miller and E. Barry; Williamsburg Graves Farm, 9 on 6/8/2007 B. Benner; Worcester Broad Meadow Brook, 20 on 6/11/2001 G. Howe. Hobomok Skipper has a fairly concentrated flight period, from the second week in May through the last week of July, according to MBC 1993-2008 records (http://www.naba.org/chapters/nabambc/flight-dates-chart.asp). Peak numbers are seen the first three weeks in July, so that the species can be seen on the NABA July Counts. Hobomok is single-brooded here and throughout its range, even in north Georgia (L. Harris 1972). The more southern-based Zabulon Skipper, on the other hand, has two to three broods. Earliest sightings: In the 23 years of BOM-MBC records 1991-2013, the six earliest "first sightings" are 5/4/2009 Petersham North Common Meadow R. Hopping; 5/6/2012 East Longmeadow, K. Parker; 5/6/2010 Paxton, E. Barry, and Waltham, J. Forbes; 5/16/2004 Amherst T. Gagnon et al. ; 5/16/2000 East Longmeadow, K. Parker; and 5/17/1991 Milford T. Dodd. The latter date was cited in the Atlas. The effect of the particularly warm springs of 2012 and 2010 can be seen here. A century ago Scudder wrote about Hobomok that “The first butterflies make their advent in the latitude of Boston during the last week of May, usually about the 27th, but sometimes by the 22nd....(1889: 1623)” Sprague (1879) reported that in Wollaston (Quincy, near Boston) the date of Hobomok's first appearance in 1878 was 25 May. In eleven of the 23 years under review, the first sighting of Hobomok Skipper has occurred earlier than Scudder's date of May 22; that is, in the first three weeks of May. That would suggest some advancement of the flight period since the time of Scudder. In another ten of the 23 years, the first sighting has occurred May 22-26, in accordance with Scudder's timing. May 25 is the traditional “frost-free’ planting date for southern New England, and the emergence of Hobomok, now seems to be occurring before that date. Latest sightings: In the same 23 years of records, 1991-2013, the four latest "last sightings" are 8/10/2002 East Longmeadow K. Parker; 8/9/2008 Colrain, M. Lynch and S. Carroll; 7/25/2003 Worcester Broad Meadow Brook WS G. Howe et al. ; and 7/25/1992 Central Berkshire NABA Count T. Tyning et al. The late date cited by the Atlas had been 7/15/1988 Tolland, E. Dunbar. Hobomok appears to be flying longer now than in Scudder’s day. Scudder wrote “...and during the latter half of the month [June] the insects diminish rapidly, sometimes disappearing entirely by the 25th, though they often remain on the wing until the end of the first week of July, or a trifle later (1889: 1623).” Many Hobomoks are seen today during the second week of July. In only two of the years 1992-2013 has the last sighting of a Hobomok been in the first week in July. There are several characteristics of Hobomok Skipper which suggest that we should keep an eye on it. First, like the Arctic, Long Dash, Indian, Cobweb and Leonard’s Skippers, and unlike the Zabulon, it does not have a southeastern coastal plain distribution in eastern United States. It does not thrive in warmer climates. Second, it is single-brooded throughout its range, and third, it appears to require woodlands, although this is uncertain. Finally, despite using a range of host grasses, Hobomok is not known for breeding in disturbed habitats, as is Zabulon Skipper. This is a northern-based species which is probably vulnerable to range contraction due to climate change (Table 6). It might well decline in the hotter parts of Massachusetts, while Zabulon may increase. However, Hobomok is currently ranked S5 or ‘secure’ in Massachusetts and surrounding states (NatureServe 2014).